Today’s guest post comes from Abbie who blogs at Farmer’s Daughter. What I learned was basic — to allow Joshua to choose what he would eat and what he didn’t want to eat; to allow him to feed himself; to offer him plenty of healthy foods to choose from; to put away the food mill and spoon; most importantly, to relax! Instead of giving bland cereal as a first food, I looked to the season. Joshua turned six months in September: apple season. It has always felt appropriate to me that Joshua was a spring baby, and it seemed fitting that Joshua’s first food was applesauce. Homemade, chunky applesauce made from apples grown on the farm where I grew up, that I picked as I walked through the orchard with my mother and carried Joshua on my back. While processed cereal didn’t feel right, applesauce sure did. I spooned a small bit of applesauce into a bowl for Joshua and allowed him to squish it between his fingers to his heart’s content. He wiped it in his hair and it got on his bib and on the floor. Not much made it into his mouth, but that didn’t matter. 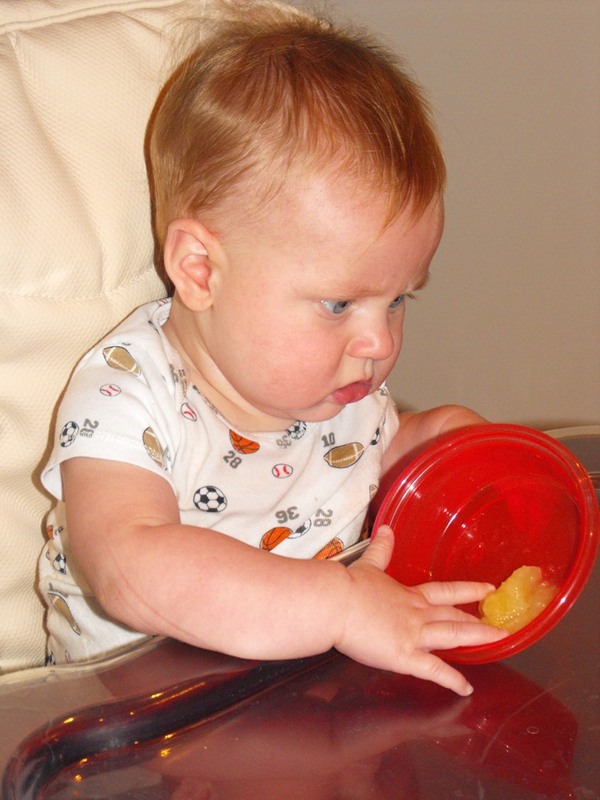 Breast milk supplies all of the nutrition he needs, and solids at six months are about learning: taste, texture, aroma and hand-eye coordination. 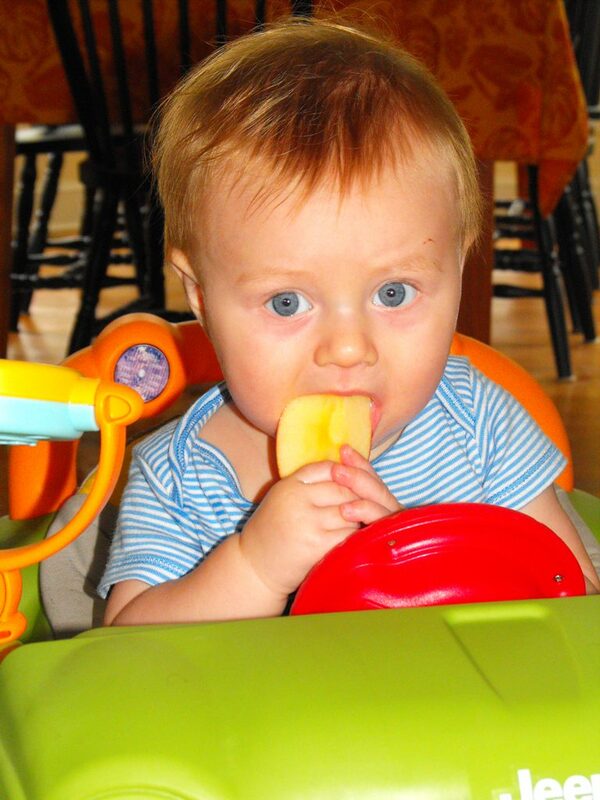 Cold apple slices quickly became a favorite for my teething baby. 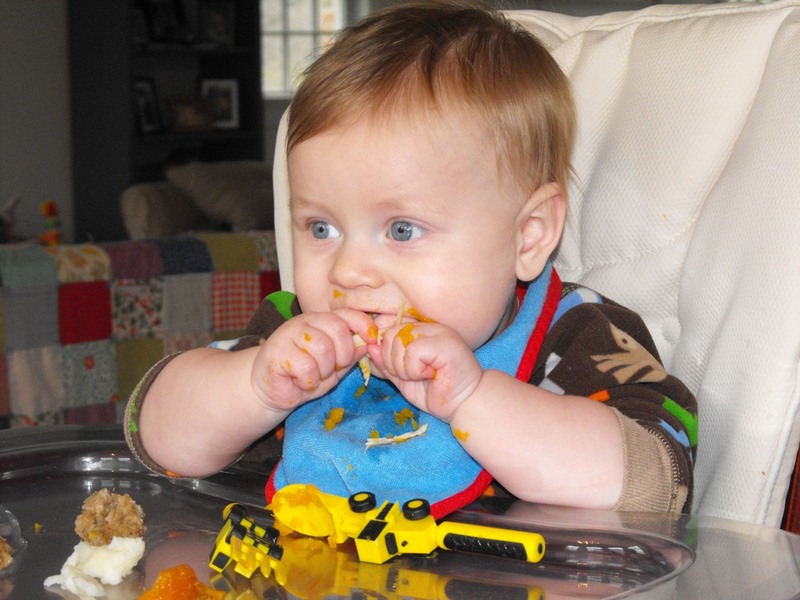 Joshua loves to feed himself and while this approach is messy, it has been a perfect fit for our family. Abbie is a wife, mother to one-year-old Joshua, environmentalist and teacher who believes in following her maternal instincts and being a steward to the Earth. She blogs about simple living, sustainability, gardening, cooking and mothering at Farmer’s Daughter. Today’s guest post comes from Amber who blogs at Strocel.com. Every morning, now, I look at the calendar and take note of the date. Because every day could be the last day I ever breastfeed my son Jacob. And maybe the last day that I ever breastfeed for the rest of my life. My second-born is weaning, and while I have pangs, there aren’t any more babies on the horizon for me right now. I breastfed Jacob’s big sister, Hannah, until she was almost three years old. A whole lot of factors led to her weaning, including my desire to conceive again (I wasn’t having much luck), my increasing physical discomfort as my milk supply dwindled, and my belief that Hannah was ready to move on. I took a fairly active role in the process, which happened over a number of months. I still remember the last time that I nursed Hannah. It was December 22, 2007. Some part of me likes that I know that date, and remember the occasion. Breastfeeding played a big part in my relationship with my daughter in her early years, and it feels fitting that I marked its conclusion, as well as its beginning. I want to do the same thing with my son. I don’t want breastfeeding to pass away without notice, even though that’s exactly what seems to be happening. Jacob is 31 months old, right now – three full months younger than Hannah was the last time that she breastfed. I didn’t expect I would be here so soon with my son, to be honest. Most of my friends and acquaintances nursed their second babies as long or longer than their first. I’m not trying to get pregnant right now, and I have less angst in general over the state of my breastfeeding relationship with Jacob. I thought I would nurse him until his third birthday, at least. But Jacob, as it turns out, is a different person altogether than Hannah. He’s gradually decreased his nursing all on his own. When he asks to nurse and it’s not a good time, he’s much faster to accept an alternative like a drink of water or a cuddle. There are no tears when I decline his request, no existential anguish bubbling to the surface. He’s a pretty easygoing kid, and he’s moving on to the next phase of his life without a lot of fuss. I’ve breastfed for the past 6 years, with a break of a little under eight months during my second pregnancy. As I contemplate the potential conclusion of my nursing career, I feel a little wistful. Can it really be possible that I’m not pregnant or breastfeeding? That I am no longer the mother of a nursling? Is this the last gasp of babyhood leaving my family? I’m not sure I’m ready to close this chapter in my life. And yet, when I consider Jacob’s imminent weaning, I don’t feel sad. I feel remarkably content. For him and for me, this feels like a fitting end to our breastfeeding relationship. We’re both moving towards it in our own way, and at our own pace. He’s ready, and I’m ready. I’m ready to have my body entirely to myself for the first time since I conceived my daughter almost seven years ago. I’m confident that I have given my son the best start I could, and that he has gotten what he needed out of breastfeeding. I don’t feel a need to encourage him back to the breast or prolong our time as a nursing pair. And so, again today, I looked at the calendar. He nursed once, and I tried to remember the details. Where were we? What was it like? Will this be the last time? I memorize as much as I can, in case Jacob doesn’t breastfeed tomorrow, or the next day, or ever again. If this is the last time, I don’t want to forget it. I’d love to hear about your own weaning experience. What was it like for you? Do you remember the last time you nursed, or not? Were you happy with how things ended? Please share! Amber is a crunchy granola mama who lives in suburban Vancouver with her husband and two children. She blogs at Strocel.com, and she runs an online course for moms about living with intention and passion at Crafting my Life. A little more than two years ago, I wrote about my experiences nursing a preschooler. At the time I discussed the fact that my nearly 4-year-old daughter was still nursing and how I never planned or expected to be nursing a 4-year-old, yet it just happened. As I suspected, it didn’t “go on forever.” I never blogged about it when Ava weaned, but that milestone occurred almost four months after my post. She was 4 1/4 years old. At that time I was also nursing my son – her younger brother. From what I can remember, she and I had talked about weaning and being done with mama milk for a while. I felt like after a long, mostly* wonderful nursing relationship with Ava, I was comfortable with the idea of her weaning. Although she wasn’t excited to wean, I felt like Ava was pretty ready too. I remember one night she went to bed without nursing (which is the only time she would nurse at that point and had been since she was 2 1/2). After all of the discussions we’d had about weaning, it seemed to me like the perfect stopping point. The next night as we cuddled to go to sleep, she asked for “na-na” and I explained to her that she was done having na-na. She cried a few tears that night, but we cuddled and she went to sleep without na-na. The next couple days she continued to ask for it before bed and sometimes cried a bit or was sad, but I never felt like it was unbearable for her. If I had felt it was absolutely unbearable for her, I would have put off weaning longer, but I never got that impression. Yes, she briefly mourned the loss, but the transition went well. After several weeks had passed and I felt fairly confident that she had lost the knack of suckling, she would – once in a while – still ask for na-na and at that point I would let her try. As I’d suspected, she couldn’t figure out how to get milk out any longer. It was a little frustrating for her, but I think it was comforting that I let her try rather than just tell her “no, you don’t have na-na anymore.” Letting her try seemed like a gentle way for her to discover on her own that she had, in fact, weaned. While I wouldn’t call what I did with Ava exactly “child-led weaning,” it felt like a pretty gentle transition and was what I deemed best for our family at that time. After nursing two kids (although usually not at the same time) for a year and a half, I was ready to go back to nursing just one child. And that brings us to the present, when my now 3 3/4-year-old son is still nursing. 😉 This time around, however, it didn’t come as any surprise to me that I’m nursing a preschooler. He seems like he might wean before Ava did, but I’m not holding my breath. Lately, he will go a few days at a time without asking for it so I think we are heading in that direction. He went five nights without nursing while I was at BlogHer this year, but when I got home – sure enough – he wanted to nurse before bed. Most recently he went about four or five nights without asking to nurse while I’ve been home. I thought he might be done altogether, but then asked to nurse again. I talked to him about possibly being done and he insisted that he was NOT, so he nursed before bed. But then the past two nights, he did not. I’m not in a big hurry for Julian to be done. I know it will be bittersweet just like it was when Ava weaned and perhaps a bit moreso since I’m fairly certain I’m not going to have any more children. However, I also see this as a milestone and a door opening to the next chapter in our relationship. Yes, we’ve had several years of a great nursing relationship, but I also look forward to what lies ahead. I’ll repeat what I said before, but this time for Julian. I am confident this won’t go on forever and when I look back on this time when he’s 10 or 20 or 30, and I look at the young man he’s become, I am hopeful that I will feel good about the choices I made and have no regrets. This isn’t the first time I’ve blogged about Nestle and is likely not going to be the last. I wrote about the company when I first learned about the Nestle boycott. And again when the Nestle Family Twitter-storm took place in 2009. I wrote about Nestle when I compiled an updated list of all of the many, many brands Nestle owns (for people who choose to boycott them). And most recently, I wrote about Nestle when I discovered that they (well, two of their brands – Stouffer’s and Butterfinger) would be one of about 80 sponsors at this year’s BlogHer Conference in New York City. My goal – throughout all of this – has never been to tell people what they should or should not do. That’s not my place. My goal has always simply been to raise awareness. There will be people who hear about the Nestle boycott and their unethical business practices and they won’t care one way or the other. Or perhaps they just won’t have time to look into it further. I know that and that’s fine. However, there will also be people who haven’t heard about what Nestle is doing and will want to learn more and find out what they can do and that’s where I like to think I can help. I’m a big fan of providing people with information and arming them with knowledge and letting them make their own choices. Now onto Nestle and just what it is that makes them so unethical. The following two sections are from a post by Annie of PhD in Parenting. …and more (see Nestle Critics Portal and Corporate Watch: Nestle SA: Corporate Crimes). Nestlé defends its unethical business practices and uses doublespeak, denials and deception in an attempt to cover up or justify those practices. When laws don’t exist or fail to hold Nestlé to account, it takes public action to force Nestlé to change. Public action can take on many forms, including boycotting Nestlé brands, helping to spread the word about Nestlé’s unethical business practices, and putting pressure on the government to pass legislation that would prevent Nestlé from doing things that put people, animals and the environment at risk. The Nestlé boycott has been going on for more than 30 years and Nestlé is still one of the three most boycotted companies in Britain. Although Nestlé officials would like to claim that the boycott has ended, it is still very much alive. But it needs to get bigger in order to have a greater impact. 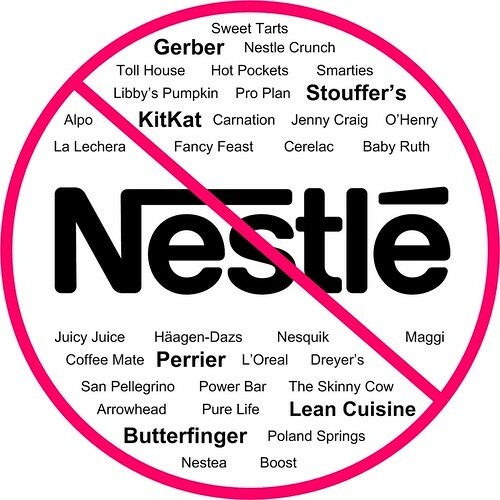 Nestlé owns a lot of brands and is the biggest food company in the world, so people wishing to boycott their brands need to do a bit of homework first to familiarize themselves with the brand names to avoid in the stores. If you disagree with Nestle’s business practices, I hope you will join Annie, me and others in raising awareness by Tweeting with the hashtag #noNestle. Let people know that you do not support Nestlé’s unethical business practices. Tweet your message to Nestlé and to others using the hashtag #noNestle. Spread the word. If you feel so inclined, you might also want to make a donation to an organization that supports breastfeeding, such as La Leche League or Best for Babes. Tweet your support! Blog your message! Share on facebook! Health Care Reform Lends Support to Breastfeeding Moms, But Is It Enough? It seems that while everyone gives lip service to the importance of breastfeeding, there isn’t a lot of support for women once they make the decision to breastfeed. Women have been asked to cover up or leave restaurants, water parks, airplanes, and stores when they try to give their baby what’s “best.” Maternity leave in the United States is, at best, 12 weeks. Women who work outside the home have often been forced to pump their breast milk in bathroom stalls, hide under a desk, or sit in their car just to get a little bit of privacy because rooms for nursing/pumping mothers just don’t exist. So yes, breast might be best for baby, but until there are more regulations in place that allow moms to breastfeed without so many roadblocks, how can breast be “best” for moms? There is, however, a bit of good news on the horizon. Health Care Reform is lending some support to breastfeeding moms with the Reasonable Break Time for Nursing Mothers law. Section 4207 of the Patient Protection and Affordable Care Act (also known as Health Care Reform), states that employers shall provide breastfeeding employees with “reasonable break time” and a private, non-bathroom place to express breast milk during the workday, up until the child’s first birthday. Employers are not required to pay for time spent expressing milk, and employers of less than 50 employees shall not be required to provide the breaks if doing so would cause “undue hardship” to their business. Currently, only 24 U.S. states, Puerto Rico, and the District of Columbia have legislation related to breastfeeding in the workplace. Yet women now comprise half the U.S. workforce, and are the primary breadwinner in nearly 4 out of 10 American families. The fastest growing segment of the workforce is women with children under age three. One thing seems pretty clear: If it’s in the country’s best interests to have new moms nurse their infants exclusively for at least six months — and the billions of dollars in health care savings indicates that it may be — then new moms should get at least six months of paid leave in which they can do so. The United States and Australia are the only two industrialized countries in the world that do not offer paid maternity leave. And moms in the Outback have a sweeter deal than we do: In Australia, your job is protected for a year, but in the United States new working moms only get that guarantee for 12 weeks. What do you think about the Reasonable Break Time for Nursing Mothers law? Is it too much? Not enough? Just right? None of the government’s business? Posted on April 9, 2010 Author Categories BlogHer Post, Breastfeeding, Health, Kids, Maternal Health, Mothering, PoliticsTags babies, baby, benefits, breast, breast-fed, breastfeed, Breastfeeding, Health, health care reform, maternity leave, moms, mothers, nursing, pumping17 Comments on Health Care Reform Lends Support to Breastfeeding Moms, But Is It Enough? Earlier this week I wrote about the police being called on a breastfeeding mom in a Michigan Target store. Mary Martinez and her husband Jose were shopping in a Harper Woods, Mich., Target store, where Mary was nursing her 4-week-old baby girl in the electronics section. They were told by a Target security guard that breastfeeding in public is “against the law” and told they had to leave. When they disputed it, the police were called. The couple and baby eventually left, feeling embarrassed. Mary has since kindly told me a little more of what happened this past Sunday. She addressed the concern that some raised that she was not being “discreet” and gave an update regarding her correspondence with the Target corporate office. I was very discreet. She’s my 3rd child and I breastfed the other 2 until they were 2, I know how to be discreet. LOL If you can watch the news clip, I was nursing then and I imagine that’s as much skin as I showed in the store…none. I spoke with [Target] corporate yesterday [Dec. 2]. I received an apology and admission of wrong doing, and that no one complained. I want an amended press release, removing the part that reads that anything escalated and that they were concerned about the safety of their other customers. …Until then, this story is to be continued. Mary also added that she’d like to tell me more about what happened, but she’s been going through a “rough time” lately and is “really tired right now.” I can only imagine. She’s four weeks postpartum, has two older children and is dealing with all of this Target stuff on top of it. She said that she hasn’t yet contacted FirstRight (a site where they collect information to determine how best to support a mother who has experienced discrimination due to breastfeeding), but she plans on it. Thanks for asking us about breastfeeding in our stores. As a family-oriented retailer, Target has a long-standing practice that supports breastfeeding in our stores. We want everyone to feel comfortable shopping at Target. Guests who choose to breastfeed in public areas of the store are welcome to do so without being made to feel uncomfortable. Additionally, we support the use of fitting rooms for women who wish to breastfeed their babies, even if others are waiting to use the fitting rooms. We strive to provide a distraction-free environment for all our guests, including nursing moms. We regret the incident in our store and will continue to provide a shopping environment that respects the needs of all guests, including nursing mothers. At Target, we work hard to provide you with an enjoyable shopping experience. If you ever have concerns during your visit, please visit the Guest Service Desk and ask to speak to the Guest Service Team Leader. They’ll make every attempt to resolve the issue while you’re in the store. We appreciate the opportunity to share this information with you. It sounds like lip service to me. When I read, “We regret the incident in our store and will continue to provide a shopping environment that respects the needs of all guests, including nursing mothers.” it sounds to me like they are sorry they are getting negative press as a result of the incident, not that they are sorry that an employee discriminated against a shopper and that the police were called. Not that they are sorry for the grief they have caused the Martinez family. I’m not calling for a boycott of Target. I think that is extreme for this situation. However, I am not sure when I will be shopping there again. I will be watching this case to see how it all pans out. I’d like to see them resolve this well. I think they should have apologized from the get-go and not released the statement about being concerned for the safety of their guests. I’ve never seen a breastfeeding mom and baby pose a safety issue. Most moms simply want to take care of the needs of their baby and go about their business. I want to address more concerns/issues that were raised in the comments section of my first post, but will save that for another post, another day.